Proper upkeep and maintenance of brakes is one of the most important steps to ensure a well running vehicle. A car with improperly functioning brakes is one of the greatest threats to the safety of both you as a driver, pedestrians, and other vehicle drivers. Because of this brakes should undergo regular inspection and maintenance at a trusted mechanic. Brake rotors do require less frequent maintenance; however rotors can certainly wear out, putting your safety as a driver at risk. 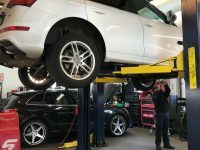 The brake system of any vehicle is comprised of a variety of different parts all working together to execute one of your car’s most vital tasks. Brake rotors are a metallic disk attached to your car’s wheel. When the brake pedal is pressed down your brake pads latch onto the brake rotor ultimately slowing then stopping the motion of your car’s wheel. What Causes Brake Rotors to Need to be Replaced? Damage to brake rotors typically occurs when drivers neglect the servicing of vehicle brake pads. This causes the metal of the worn break pad to grind against the metal of the break rotor causing cumulative damage to the rotor that eventually causes the rotor to need replacing. Keeping brakes well maintained by regularly servicing them is an important part of vehicle upkeep. However, brakes can start to have problems prematurely and as such there are important signs that your brakes need inspection. These signs warrant immediate attention at your local trusted mechanic. Brake rotors do not usually cause such issues but frequently become damaged alongside these symptoms. Regular inspection and maintenance is the most reliable way to ensure your brake rotors and brake system are functioning optimally. The above signs may indicate that as driver you should increase the frequency at which such inspection and maintenance is carried out.